IFA: Technics set to release a new turntable in 2016 | What Hi-Fi? Technics has blown the roof off its IFA press conference by announcing a prototype turntable, scheduled for release in 2016. After the relaunch of the Technics brand last year, the question of whether the company would release a new turntable has hung in the air. This year, Technics finally confirmed what we all wanted to hear: there will be a new Technics deck. 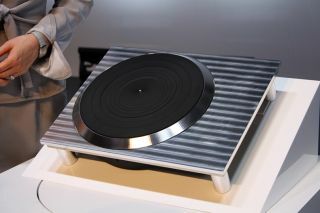 A prototype was unveiled at IFA 2015 in Berlin of what promises to be the first Technics turntable since the release of the SL-1200MK6 in 2007, itself the latest in the famous SL-1200 range. It's billed as a direct drive, analogue turntable. The turntable does not currently have a name or price - so no word whether it will continue the SL dynasty. Nor is there a release date besides a vague eye on a 2016 commercial launch.